Jim, I am just now looking at summarytable() and wow. I have been attempting to do several of the features of summarytable() myself with limited success. Can summarytable() use a variable with an array instead of a database as the source data? And / or, can summarytable() be used to generate an html table? Yes, that is the correct reaction. I’m kidding, of course, but then again not really. It is a very powerful function, and is the core behind the Summary Table Workshop. For me, it has now 95% replaced grouping and summary records. Also, don’t miss the related crosstab( function. For those of you that haven’t looked at these functions yet, I highly recommend you follow Steve’s lead. 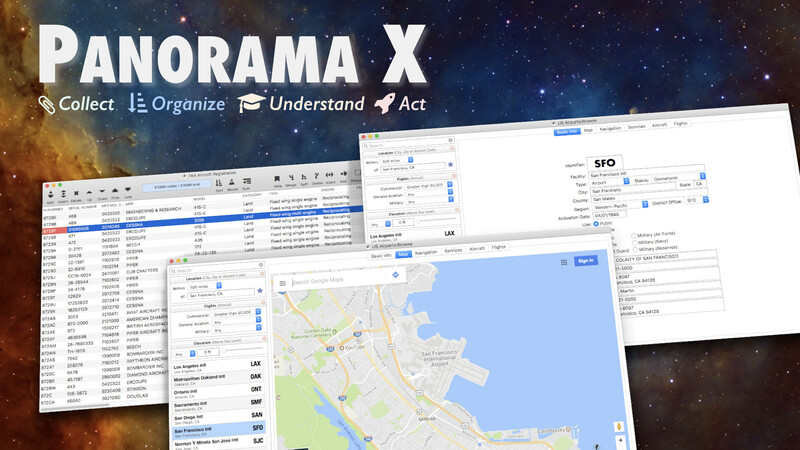 The Panorama X summarytable( function scans a database to build a text array containing summary breakdown information totals, averages, etc. Can summarytable() use a variable with an array instead of a database as the source data? No, it is for databases only. And I must tell you, if you are keeping so much data in an array that you want to summarize that data, I am going to question why you aren’t just using a database for that data. And / or, can summarytable() be used to generate an html table? Sure, just take the output from the summarytable( function and run it through the htmlarraytable statement! The Panorama X htmlarraytable statement generates an HTML table from an arrray. Pretty cool! BTW you wrote “complecated” about halfway through that help page… it should be “complicated”. you wrote “complecated” about halfway through that help page… it should be “complicated”. For future reference, you could actually submit that correction possibly faster than writing that sentence!! However, I submitted it already this time.